It’s been awhile since we’ve seen the Superbusy Mummy Blogger. She’s had an interesting month, the first half of which was a little blurred with painkillers and anti-inflamatories, while the second half has been jam packed with TimTams and home-made pies. This month the Superbusy Mummy Blogger joined a group of writers to attempt NENANWRIMO. If you’ve heard of NANOWRIMO (the challenge to write fifty thousand words in a month), you may be asking what the NE is for. “Near Enough”. I knew I was going to like these women immediately. Despite the name wreaking of procrastination, there have been many in the group who today have announced making it to fifty thousand words. There was one woman who wrote ten thousand in a day. Yep, one day. That was the day I wrote three hundred words. Thankfully though, there’s quite a few of us who remain ominously quiet on providing solid numbers. I’ve given myself until the 12th December. 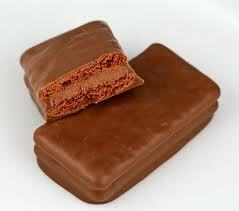 In the meantime, TimTam anyone?